Fifteen Beijing teenagers are under detention for robbing Sanlitun visitors at knifepoint and then blowing their earnings at area bars and restaurants, Chinese media reports. The kids, ranging in age from 13 to 18, were caught on Jan 9 after several robberies were reported near Gongti Beilu in Sanlitun. The gang would bump into pedestrians as a pretext to getting them to stop, and then rob them while wielding electric batons, baseball bats, and knives police reports indicate. The gang, all students in high schools in Chaoyang, Shunyi, and Changping, has been operating a while and apparently frequently changed outfits and hairstyles to avoid detection. 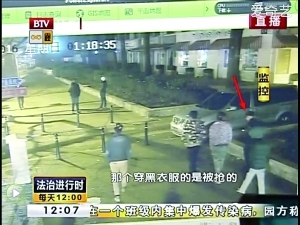 One victim, surnamed Jin, reported that he was bumped into by two teenagers while walking in the Sanlitun area on Jan 8. One teen claimed to be hurt and demanded money to pay for a visit to the hospital, but when the victim tried to brush them off as typical street scammers, they quickly pulled out knives, and others from the gang popped out to surround him. He was then dragged inside a nearby housing compound and forced to kneel in the ground, and RMB 800 in cash was taken from his wallet. Another teen grabbed his phone and managed to transfer RMB 300 from the victim’s WeChat account. Not satisfied, the theives then dragged the man to a nearby ATM and forced him to withdraw another RMB 1,000 and stole his phone. Another victim told police the gang was enraged to find that their victim had no cash and slashed at him with his knife, cutting his coat and causing a minor injury. Police from the Sanlitun District Police Station have several of the incidents on tape from area security cameras and the perpetrators appear to be the same group of teens. Each member of the gang had different roles, one responsible for keeping lookout, another selecting victims, another conducting the robbery itself. Police said that while the teens were young, their knowledge of keeping themselves undercover was quite sophisticated, always wearing hats and wearing pollution masks, and never wearing the same outfit. The police noticed that one of the perpetrators wore a scarf to several of the robberies, providing the break in the case the police needed. The gang operated mostly between midnight and 3am, and tended to target young people, police said. One suspect, surnamed Tian, is in his first year in high school, and told police he spends his days in school and his nights robbing people in Sanlitun. Tian said that they could rob five to six victims per night, and if the victim does not cooperate, they’ll deliver a beating. Another of the subjects, surnamed Cui, said every time he goes out he’ll get RMB 500 to RMB 600 as his share, but some of the more powerful gang members will take up to RMB 800. Most of the time they immediately blow the money partying in area restaurants and bars, Cui said. Cui also said the gang members were all junior high school classmates, but now attend schools in Chaoyang, Shunyi, and Changping, some as boarders. While rounding up gang members, police found that one gang member was storing the tools of his trade — electric batons and baseball bats — at home. The parent said he was very busy and only sees the student on the weekend as he boards at school, and doesn’t communicate with him much, so he had no idea his kid was a thief — nor that the weapons were stored at home — until the police brought it to his attention.